Home / Blog / Camino Frances / What is the Camino Francés? The Camino Francés (or French Way) is the most popular of all the routes of the Camino de Santiago. It usually starts in St-Jean-Pied-de-Port on the French side of the Pyrenees or in Roncesvalles on the Spanish side (Pyrenees & Pamplona – Section 1). This route goes through the magnificient cities of Pamplona, Logroño, Burgos and León, before entering in Galicia, finsihing in the stunning Santiago de Compostela. Each of those town are stages which permit you to discover local culture and history. you can for example taste the wine from the Rioja Region in Logroño, you can discover the medieval Spain and the Home of El Cid in Burgos and then enjoy the beautiful mountains of the province of León. The last hundred kilometres from Sarria to Santiago are the part of the Way where you will meet the more pilgrims, as it is the most walked section. You will be rewarded at the end of your walk by the magnificent Cathedral of Santiago de Compostela, where it is believed that the remains of St James are buried. This is the complete itinerary for the Camino French Way (or Camino Francés), with traditional stages. Please note that “split days” have not been included in the table. Roncesvalles 26 The first section of the French Way, Camino Frances starts in St Jean Pied de Port in the French Basque Country, crosses the Pyrenees and finishes in the city of Pamplona, world famous for its Bull Run, San Fermín. This is one of the most challenging but beautiful parts, especially if you take the ‘Napoleon Route’ over the Roncesvalles Pass (1450m). The views of the Pyrenees are worth the effort! Puente la Reina 23 This section of the Camino de Santiago along the French Way, Camino Francés starts in the city of Pamplona (Iruña in Basque), famous for its San Fermín Bull Run festival taking place from 7th July every year. The section finishes in Logroño, capital of La Rioja wine region, and a fantastic city to discover authentic Spanish ‘tapas’. 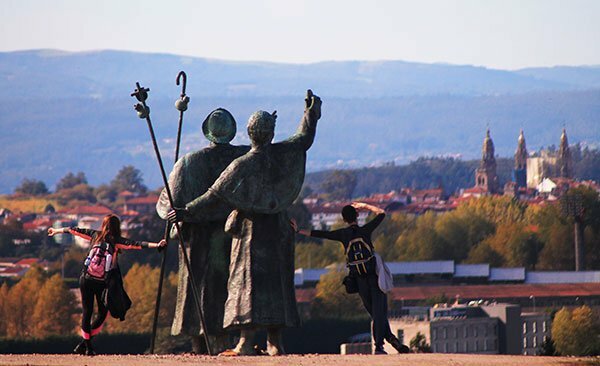 From the pilgrim sculpture at Alto del Perdón, you will enjoy panoramic views of Pamplona behind and the vast countryside ahead, before continuing on your way. On this section of the Camino, you will walk across the mountains of Navarra and La Rioja vineyards, passing medieval bridges, castles, churches and picturesque villages along the way, such as Puente de la Reina, Cirauqui, Estella-Lizarra and Viana. Stop at Bodegas Irache and the Wine Museum for a rest and a quick sip at the free wine fountain. Najera 26 Section 3 of the Camino de Santiago along the French Way starts in Logroño, capital of the famous Rioja wine region. Explore the city and treat yourself to ‘tapas’ in the lively Calle del Laurel before you start your journey. The terrain becomes easier than in previous stages of the Camino and you will walk sections across undulating farmland and vineyards, passing castles, monasteries and charming villages. One of the highlights is Santo Domingo de la Calzada and its historic centre, an important stop for pilgrims “on the Camino since the Middle Ages. You will finish your walk in the majestic city of Burgos, home of ‘El Cid’, where you should visit its magnificent cathedral, possibly the most beautiful in Spain. Hornillos del Camino 20 Section 4 of the Camino de Santiago along the French Way (Camino Francés) starts in majestic Burgos, hometown of ‘El Cid’ and considered the Gothic capital of Spain. This section of the French Way finishes in the village of Sahagún, in the heart of the Meseta with its vast wide open landscapes. The sounds of nature and endless crop fields will be your companions for this section of the Camino de Santiago, dotted with hamlets, picturesque sleepy villages and Romanesque churches. El Burgo Ranero 17 Starting in the medieval town of Sahagún, section 5 of the Camino de Santiago along the French Way will take you across the Meseta, the immense Castilian Plateau (900m) and its villages.You will finish this walking section in the city of León, where you can admire the cathedral, the remains of its Roman walls, the Romanesque Royal Basilica of Saint Isidoro and Gaudí’s neo-Gothic Casa de Botines. Mazarife 22 Section 6 of the Camino de Santiago along the French Way (Camino Francés) starts in the lively city of León and finishes in Ponferrada, built by the Templars in the 12th century. Along the way, you will pass the hilltop city of Astorga famous for its chocolates and other sweet delicacies. After Astorga, you will start your ascent to the spectacular and unscathed León Mountains (Montes de León), passing rustic mountain villages and hamlets before reaching El Bierzo region. Your destination for this Camino section is Ponferrada, capital of El Bierzo region and the last city before Santiago de Compostela. Villafranca del Bierzo 23 Section 7 of the Camino de Santiago along the French Way (Camino Francés)starts in Ponferrada, with its imposing Templars Castle, and finishes in the market town of Sarria, the most popular Camino starting point. You will begin your journey heading to Villafranca del Bierzo, a gorgeous town surrounded by idyllic countryside. After Villafranca, a challenging ascent will lead to the mountains of O Cebreiro. You will enter Galicia via O Cebreiro, a stunning mountain village in a region of outstanding natural beauty. After O Cebreiro, the Camino will continue along forest tracks towards Sarria, just over 100km away from Santiago. An alternative route will take you by the impressive Samos Monastery. Portomarin 23 This is the most popular walking tour of the Camino de Santiago. Perfect for those looking to capture the essence of the Camino: a nice walk, good food and wine, discovering local customs, meeting fellow pilgrims and enjoying the unique atmosphere of it all. You won’t forget a single minute of it!This section of the Camino de Santiago starts in Sarria and covers the last 100km of the Camino Francés, the minimum required to apply for your Compostela certificate. The Camino will take you across woodlands, farmland and rustic hamlets, following tracks and paths lined by granite stone walls. The green rolling landscape of Galicia is part of each day’s walk, until you approach your final destination: the mythical city of Santiago de Compostela. If you want more information about the Camino Francés, you can go on to our Camino de Santiago French Way page and then click on the section you are interested in on the map. Would probably average about 10 – 12 miles per day.